Asha Deep Foundation is a Non Profit Organisation working for the betterment of the community since the past 35 years. Since its inception in 1983 by Fr. A.R. Rajamoney, the foundation has laid immense emphasis on serving the society at large and impacting as many lives as possible. It has always aimed at holistic development of the community people exerting importance to all demographics equally. Over its long journey, the foundation has successfully launched its centres in five states of India (Delhi, Mumbai, Chennai, Haryana and Uttar Pradesh). The foundation is running numerous projects placing special focus on Education, Health, Skill, Trainings and Placements.ADF is trying to place focus on the lower section of the society who are unable to access basic level of resources for existence. ADF has over 23 projects running which span from mother and child care till the end of the life cycle. All people of community including women, children, senior citizen, physically challenged and orphan and destitute are being benefited by the projects. As of Nov 2016, India is the second-most unequal country in the world. The richest 10% of the Indians own 80.7% of the wealth. Rising inequality is a threat to the economic development of the nation which needs to be addressed immediately. Our government is taking up a lot of initiatives to bridge the gap. To make the process quicker and help the nation achieve the goal a tad bit faster, ADF is trying to contribute its share in the development of the nation. Over past many years, ADF has ventured into mutually-beneficial relationships with the Government to help create a visible change in the community. Additionally, a lot of corporates have lend their helping hand to help us achieve the vision that the foundation has aimed at since its initiation. One of the main aim of ADF is to empower people and make them self-reliant so that they can shape their own destiny. Asha Deep Foundation is executing the development activities in the urban slums, resettlement colonies and rural to reach out maximum number of community people who are socially, economically, politically and culturally disadvantaged. It aims to increase its impact to the entire country and create maximum influence in the coming future. To help people realise their potentialities and human dignity and create their own destiny. To work amongst the deprived and underprivileged community to inspire and motivity them to realise their human dignity, develop their own capacity and help them to solve their own problems. The organisation strives to work for the social and economic development of the people by providing whatever practical help they need in the form of information, advice, capacity building, training and support. Father Rajamoney was born on 25th June 1936 at Dohnavar, Tirunelveli Dist, Chennai, Tamil Nadu, India. The son of Late Dr. Pakia Nathan Daniel Rajamoney and Late Mrs. Sellammal Rajamoney was the eighth child of his parents. He has seven brothers and four sisters. He studied at St. John’s High School-Malaysia and did his B.Ed. from Meston Training College Royapetttah, Chennai. After this, he went for higher study in Theology by doing Bachelor of Divinity (BD) from Bishop’s College, Kolkata. 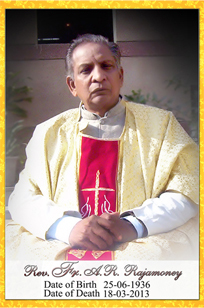 He came to Delhi in the year 1967 and joined the Brotherhood of Ascended Christ-Delhi Brotherhood Society. He also started to serve as Presbyter for the Tamil Congregation at Cathedral Church of Redemption. Continuing with his service , in 1973 he started the social development work with a vision to create an environment in the community and society at large where every human being can live with peace, justice, unity and self-sufficiency without any discrimination. At that time people who were suffering from leprosy were begging at places of worship. They were staying at government allotted areas in Tahirpur, Seemapuri and Nangdnagari, Delhi. In these areas there were no basic facilities to lead a normal life. At this time Father stayed with the leprosy patients and started working among them and made them self-reliant through various income generation activities. He also started working in harmony with the government for meeting the basic necessities such as electricity, water, proper roads and rehabilitation schemes to be available in the leprosy inhabited communities. He initiated a Community Based Organization known as “Anandgram Kustrogi Kalyan Samiti” at Anandgram, Tahirpur, Delhi. The children of leprosy patients were not given admission in schools due to societal assumptions. For these children Father established a school in Old Seemapuri where children can learn without any discrimination and can be part of the mainstream society. He also established two more schools for Dalit, neglected and minority children. Even today around 2500 children are regularly attending the schools and getting quality education. Father’s work did not end here. 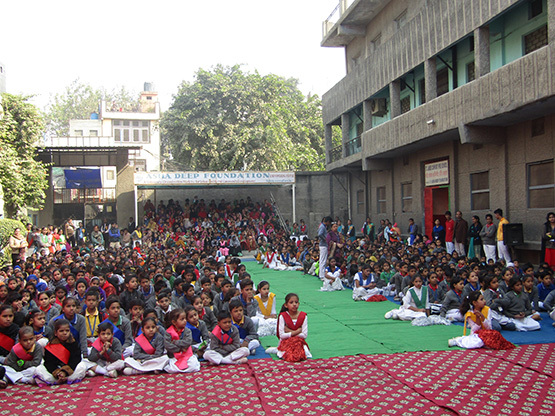 Father initiated and designed a programme for holistic development of street and working children in Delhi. Through this program approximately 2000 vulnerable children have been mainstreamed in the society. In 1982 he started giving attention in Shahid Nagar, Ghaziabad, U.P. The community was very underdeveloped. He made a jhuggi and started living there. He established two beautiful homes for orphan and destitute children and through these homes many children are getting benefit and building their bright future. This effort will continue. He set off a well-equipped Vocational and Technical Training Centre for community youth who are not able to go for higher education or training due to some reason or the other and even today lot of boys and girls are availing good training and making their life successful. Father was still not satisfied with his work. His ideology was looking for areas in the society where people are still neglected. He came to now of some villages in Ghaziabad which was a totally patriarchal society. Women were neglected in these villages. He was very concerned for the development of rural (village) women, children and farmers; keeping these things in his mind he purchased a piece of land in Loni block of Ghaziabad District (U.P). In 2000 he established an Integrated Rural Development Centre in Farukh Nagar, Ghaziabad, U.P. catering social services to five villages. Most of the village people are availing benefits from this program. Because of these programme the effects of patriarchal society has been reduced, women became more independent and gain the decision making power and are moving towards reaching equal status with men. In the year 2005 he established the organization Asha Deep Foundation (ADF) and reached the unreached people of different states. Today because of him Asha Deep Foundation is able to help more than 5, 00, 000 people of 73 slums of Delhi and Uttar Pradesh. With great sadness ADF has to say that Father is no more with us and has left for the heavenly abode on 18.03.2013. But his work and life will always remain with us. His blessings will always be with us and ADF team will work together to take forward the work Father Rajamoney has started.